I’m sure we’ve all heard of this wonder vegetable before, but what’s really so great about kale? From far and up close it just looks like a bunch of thick dark curly leaves. Isn’t it just like any of the other dark leafy greens? I decided to do a bit of investigating. As it turns out, kale is really a lot more than a ‘one hit wonder’! Kale is part of the Brassica family, which includes cruciferous vegetables like Brussel sprouts, broccoli, and cabbage. 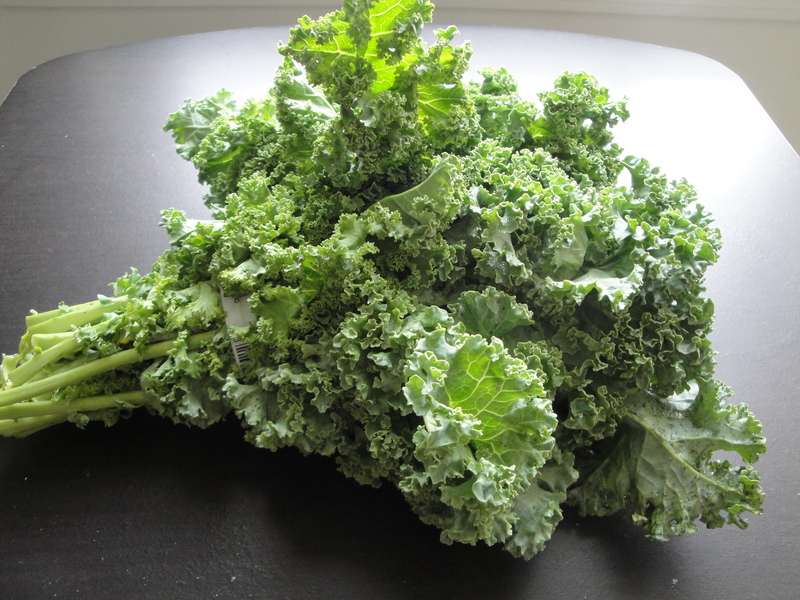 There are actually 3 varieties of kale (curly, ornamental and dinosaur types). The benefits of eating kale are enormous. One cup of chopped raw kale provides almost 3g of protein, 2.4g fiber, 100mg calcium, nearly 1mg of iron, 80mg vitamin C, 335µg vitamin A and 472µg vitamin K. In fact, leafy greens like collard greens, turnip greens, spinach, mustard greens and Swiss chard all pale in comparison to kale in terms of these nutrients. One cup of raw chopped kale actually has 3 times more calcium and protein than spinach, 4 times more vitamin A than mustard greens, and about the same amount of vitamin C as an orange. Along with important anti-cancer antioxidants like carotenoids and flavonoids , kale also provides eye-health promoting lutein and zeaxanthin compounds. And all this for only about $1 US dollar for a raw bunch! So how can you eat kale? Incorporate it into your cooking like other green leafy vegetables. For example, use kale in a salad, throw chopped kale into stews, soups, lasagna, quiche, pasta or add sautéed kale onto pizza. If you’re more adventurous, make pesto sauce with it, turn it into ‘kale’slaw (instead of using cabbage), blend it into green smoothies or even use it instead of flour/corn tortillas as a burrito shell. Heck, I bet you can even steam or boil and blend it down to make a kale puree for baby. I feel I’ve only touched the tip of the iceberg in terms of incorporating this power veggie into my family! ← What’s In A Durian?